Most people get their notions of Mardi Gras from the ribald scenes we’ve all seen of the revelry in New Orleans. 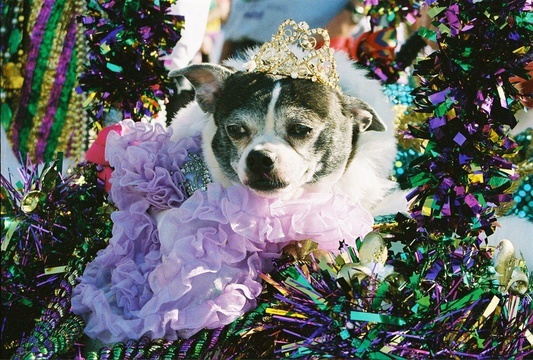 But the origins, traditions and even festivity of this great carnival is not necessarily like the R-rated shenanigans in the Big Easy — as one discovers while celebrating Mardi Gras in Southwest Louisiana, in the very heart of Cajun country. Mardi Gras — French for Fat Tuesday — derives from the day before Ash Wednesday, when people were wont to party as a last fling before observing the privations of Lent. Since it is hard to get a lot of serious partying done in just one day, the hoopla begins the Friday before, setting off five days of merrymaking. In Lake Charles, LA, the hub of Mardi Gras activity in the state’s southwest, Friday evening witnesses the first of a series of daily parades through the expectant city. Throngs of cheering spectators of all ages line the streets, many calling out to the passing floats, “Throw me something, Mister!” They are clamoring, of course, for beads — those colorful purple, gold and green trinkets that are waiting to be snatched by eager hands, or snared by butterfly nets or even upturned open umbrellas. Over the course of the next few days, dozens of elaborately decorated floats manned by hundreds of krewe members will fling thousands of strands of beads to tens of thousands of revelers; and that is only part of the fun of a SWLA Mardi Gras. 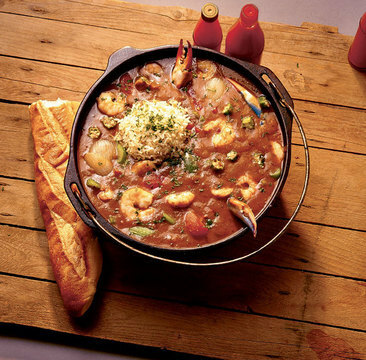 On Saturday morning, the Lake Charles Civic Center hosts the gastronomic extravaganza of the year: the annual Gumbo Cook-Off. Forget any preconceived notions from previous BBQ or chili competitions you may have attended — especially when it comes to noise level. With more than 50 krewes and other competing teams filling the hall and vying to win the Mardi Gras “spirit stick,” the raucous revelry is practically non-stop. There are three categories to whet the appetite: traditional chicken and andouille sausage; seafood; and wild game. Some of the latter were quite exotic — like pheasant, and elk sausage. Alligator featured prominently, along with rabbit, and even the occasional squirrel. It is physically impossible to taste all the gumbos, so a good strategy is to check out previous years’ winners. Tip: Restaurants, who do this for a living, compete in the “professionals” category; the L’Auberge Casino Hotel’s Jack Daniels has won multiple times. Of course, gumbo is not the only regional specialty that has visitors licking their lips. Boudin is the white Cajun sausage that is so popular it has spawned trails throughout the state of Louisiana, and SWLA is no exception. There are nearly 30 tasty stops on the boudin trail that fans out from Lake Charles, each one featuring its own particular recipe designed to keep you coming back for more. Not ordinarily a sausage fan? Try the crunchy deep-fried version known as a boudin ball. Fortunately, Mardi Gras also falls during crawfish season, another star of SWLA cuisine. The seafood riches of the Gulf Coast are featured in such top Lake Charles restaurants as Steamboat Bill’s and Seafood Palace in the casual dining category, or Luna Bar and Grill and Pujo Street Cafe as more upscale choices. In a league of its own is the Ember Grille and Wine Bar, located in the L’Auberge Casino Hotel. 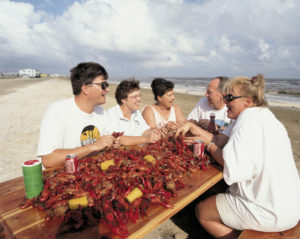 The distinctive music of Louisiana enjoys pride of place along with cuisine as a highlight of any visit to Cajun country. Zydeco, that toe-tapping genre that elevates the washboard to the status of musical instrument, takes center stage in the park outside the Lake Charles Civic Center for outdoor dancing on Saturday afternoon. The whole family can dance the two-step, while the youngest members frolic in the adjacent elaborate playground. 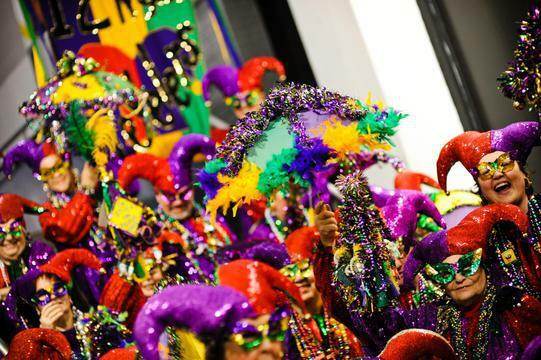 A worthwhile activity on Sunday while waiting for the afternoon’s Children’s Parade is a visit to the Mardi Gras Museum of Imperial Calcasieu, featuring the largest Mardi Gras costume display in the world. There is even a mock float that kids can climb aboard. A great outdoor option is an excursion to the Creole Nature Trail and Pintail Wildlife Drive, comprising five wildlife refuges and sanctuaries encompassing 180 miles of marshland and coastal prairie constituting habitats for alligators and numerous waterfowl and migratory birds. Get the scoop on this National Scenic Byway and All-American Road at the Cameron Prairie National Wildlife Refuge Visitors Center, starring animatronic figures that depict Cajun culture along the inland waterways. (Note: Due to federal government budget cuts, the visitors center is open only on weekdays.) Just a short drive away is Rutherford Beach, offering some of the best “shelling” along the Gulf of Mexico. On Monday evening, the elaborate Royal Gala is when the fancy costumes like those on display in the Mardi Gras Museum come to life, as the kings and queens of the many krewes present themselves to the all-female Mardi Gras royal court. Krewe monarchs and their entourages dance and cavort their way towards the thrones before paying the prescribed obsequious homage. 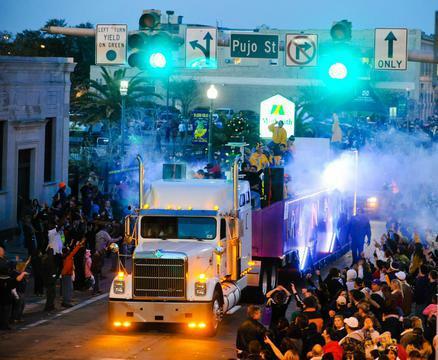 Finally, Fat Tuesday rolls around, with two of the major highlights of the week: the Chicken Run and the Krewe of Krewes Parade. The Iowa (pronounced eye-oh-ay) Chicken Run is the rural celebration of Mardi Gras, complete with costumed riders on horseback, hay rides, and chasing frantic chickens destined for gumbo stardom. The evening’s Krewe of Krewes Parade is the climax of Mardi Gras: close to 100 floats representing krewes, businesses and civic organizations wend their way through the streets of the city, launching fistfuls of beads into the air at beseeching crowds of spectators of all ages — from infants to nonagenarians. The lively music accompanying the procession will continue to echo throughout the night, in restaurants and nightclubs hosting parties that extend the annual celebration through the wee hours of the next morning. Buzzy Gordon. Over the course of a 35-year career that has spanned more than 80 countries, award-winning journalist Buzzy Gordon has been a reporter, editor, and travel writer on five continents. His work has appeared in USA Today (where he was a regular travel columnist), National Geographic Traveler, The Los Angeles Times and The Washington Post, among other leading publications. 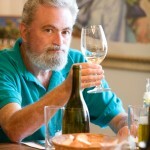 Buzzy is the author of Frommer’s Jerusalem Day by Day Guide, a contributing editor at Jax Fax Magazine, and a regular contributor to LuxuryLatinAmerica.com and TotallyJewishTravel.com.